100 days ago major combat operations ended and the Iraqi people were liberated from the brutal regime of Saddam Hussein. Since then, there have been 100 days of progress in the reconstruction of Iraq and the renewal of the Iraqi people. President Bush on Friday said, "Because of Kerick's leadership, his knowledge and his experience, he was able to stand up a police force in Baghdad in a very quick period of time." President Bush today addressed the United Nations General Assembly in New York City. Thank you all very much. Thanks for the warm welcome. It's a fine day here in Georgia. President Address to the Nation on the War on Terror Nearly two years ago, following deadly attacks on our country, we began a systematic campaign against terrorism. These months have been a time of new responsibilities, and sacrifice, and national resolve and great progress. President Bush and Secretary Rumseld took questions from the media after a meeting in Crawford, Texas Friday, the hundredth day since major military operations ended in Iraq. President Bush said, "We've been there a hundred days. We've made a lot of progress in a hundred days, and I am pleased with the progress we've made, but fully recognize we've got a lot more work to do." What we knew going into the war was that this man was a threat. He had weapons of mass destruction. He had used them before. He was continuing to try to improve his weapons programs. In thanking Ambassador Bremer Wednesday, President Bush said, "The nations in our coalition are determined to help the Iraqi people recover from years of tyranny. And we are determined to help build a free, and sovereign, and democratic nation." Good afternoon. First, I'll give a brief overview of the President's schedule in New York this week and highlights from his speech to the United Nations General Assembly, then I'll be happy to take your questions. We were pleased to learn from the Department of Defense of todays action against Uday and Qusay Hussein. Over 30 years, many Iraqis were tortured, mutilated, and executed by their government. Perceptions of disloyal behavior would land entire families in jail ... or worse. 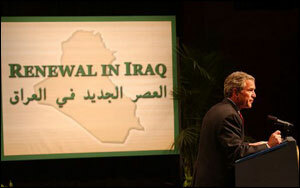 Now, the people of Iraq are free from fear of Saddam and his regime. They are telling reporters their stories of unspeakable acts of brutality. We asked U.S. soldiers in Iraq: "What do you want the Iraqi people to know about America's mission?" Click here for a selection of responses.